If I do say so myself, I have a very cool family. We are an introverted bunch. Half of us live on the East Coast, and half live on the West Coast. In addition to my parents, I have two brothers and one sister, with 17 years between the first and the last. We are terrible about calling, only a little better about e-mailing. You would think that we wouldn’t be that close. But we are. Last Christmas, my younger brother and I started a family blog. It’s our own little spot where we can all get together and be “just us”. We post distorted portraits of ourselves, pictures of the kids’ school projects, intrepid explorations and crazy hairdos. We crack each other up. Good heavens, Krista! Your alphabets are outstanding! I so love, love, love this. And so brilliant, how you worked in eXtended. I don’t think you could have created something this gorgeous and warm if you didn’t have such a wonderful family yourself. Wowie! Corfu, or that back porch! I love it, Krista…we shall see where he sets off to. Thanks for your kind visit! Have a great rest of the week and Easter! This is so lovely. Wonderful colors! 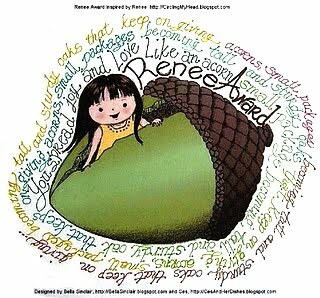 I hadn’t known that we already lost sweet Renee. This reward is a wonderful tribute. This is just so awesome. so much work has gone into this. All the ideas, and details…colouring. Wow, really well done! I absolutely love your hand writing! So curvy and nice! 🙂 Your family values sure shine through! Yet another masterpiece my dear! 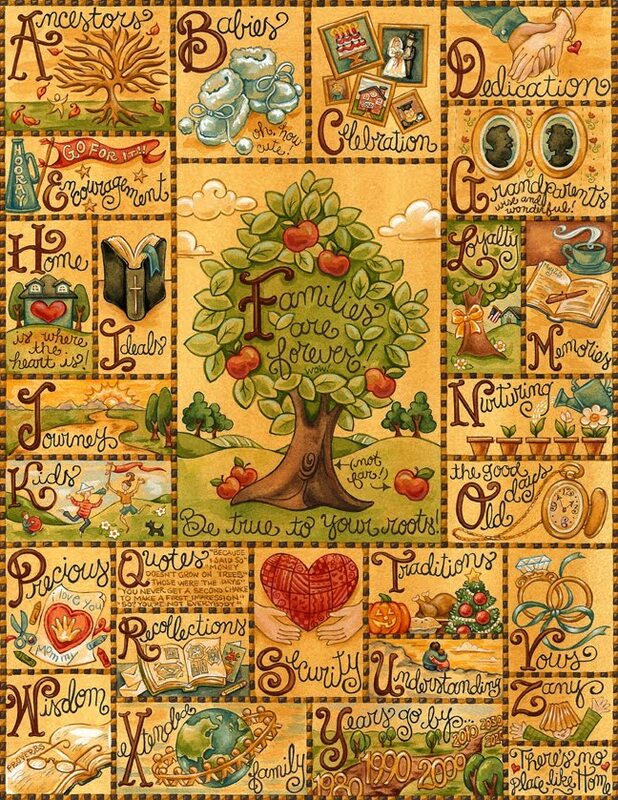 Everyone must click on this to see all your clever details – ‘not far’ falls the apples from the tree, the quotes, the baby booties, and all the other details that make your work so special! I am so happy and honored to be a family friend!